I wanted this post out this past Sunday but the past Saturday was my birthday so I took that day off and blogging got pushed back as a result. Can’t say I regret it since, well, it was my birthday. And really, I’m just late again. What else is new with me? By the way, this post marks the first in a slightly different approach to my Lightning Rounds. Before, I would group First Impressions into this kind of post for the sake of brevity and time and crank them out when there’s enough on the plate. This season, I decided it’d be better for my sanity to merge it with the weekly format I tried using this past Summer and Fall. So, ideally, it should be one big Lightning Round every week and I’m hoping I will be able to write one every week this season. Maybe it still won’t pan out but eh, it’s worth a shot. Please note that what I cover in the Lightning Rounds could change from week to week based on interest level and they probably won’t have a finalized “lineup” until the midseason. I take it back, Pastel Memories. Dimension High School is the WTF anime of the season. The mixture of live-action footage and animation is atypical but that pales in comparison to the plot of the show. 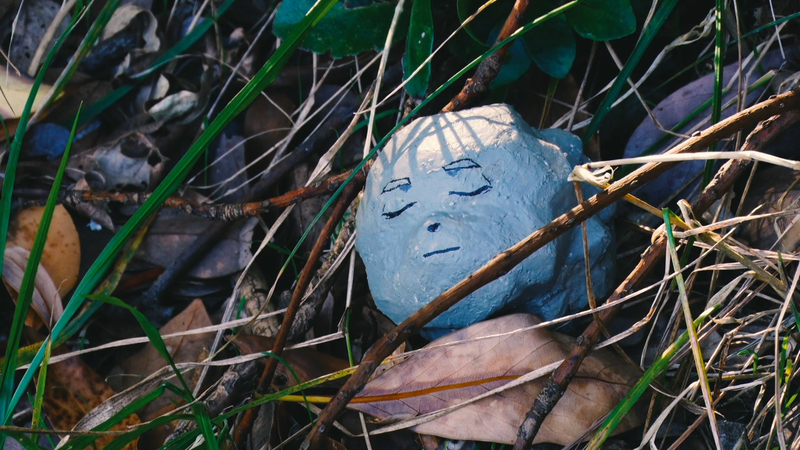 Four high school students and their teacher meet a talking rock who tasks them to travel to a parallel dimension and combat the evil forces there in a series of trivia questions. I couldn’t make this up no matter how I hard try. The trivia questions themselves are admittedly a little clever but why they must exist in a plot this strange is beyond me. Maybe if I was morbidly curious, I’d watch a little more of Dimension High School but frankly, I think I’ve see enough. Hold on, a mysterious pink-haired girl enlists the help of a man to help her ride a war machine to combat an unknown foe…is this a Darling in the FranXX knock-off? In all seriousness, I was just bored with Girly Air Force. Didn’t care about the male protagonist and the fancy tech simply being real world aircraft recolored with some glowing effects feel very uninspired. I don’t think I’ll be missing much from this show so I’m dropping it. I personally don’t find Joshua that riveting of a character so an entire episode from his perspective made for a very pedestrian experience for me. That said, I must admit that it was ballsy of The Price of Smiles to kill him off at the end of the second episode. It’s predictable based on Joshua’s dialogue and actions but I think the takeaway to have here is what it effect it has on the story from here on out. 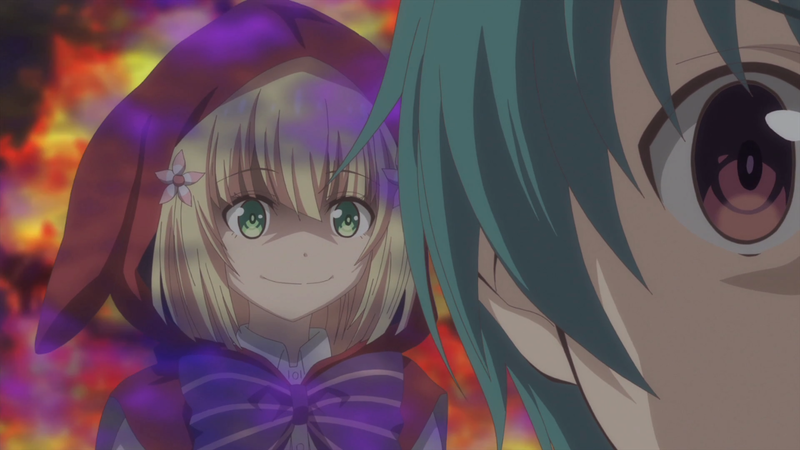 Yuuki is devastated and Stella, who finally appears in a cameo, appears to have lost some comrades in that last battle. Each girl is at odds with the other’s country right now and that makes me wonder how exactly they’ll end up as friends if they ever do meet each other. I’m still not completely sold on The Price of Smiles but I must admit that it keeps finding a way to entice me into watching a little bit more. Grimms Notes might be one of those anime where I’ll have to settle on it being fluff. The idea that the inhabitants of various fairy tales have books that detail their entire lives has serious potential in regards to the theme of fate but I highly doubt the story will try to challenge it. There’s still fun to be had with this series though. The characters using cards to transform into iconic fairy tale characters with special abilities is indicative of the anime’s mobile game roots but still cool nonetheless. I also really enjoyed this premiere’s take on Red Riding Hood — a girl painfully aware of her destiny and falls prey to a corrupting force that proceeds warp her insecurities even further. It’d be great if the story could be more nuanced but I still enjoyed what I saw of Grimms Note so I’ll try a little bit more of it. 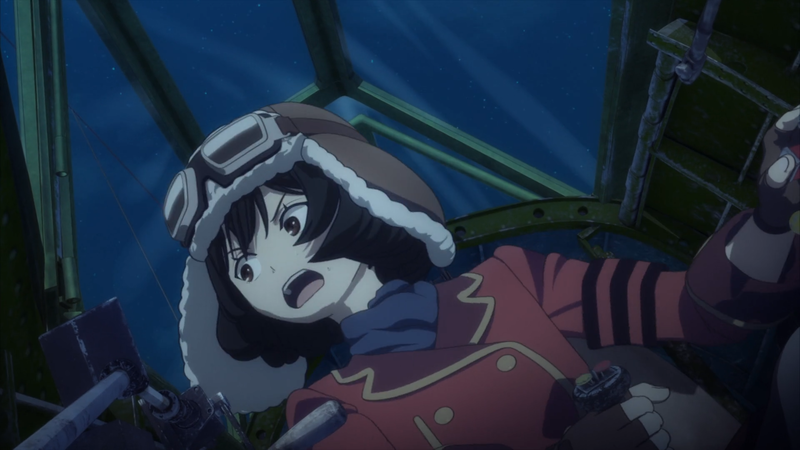 Don’t get me wrong, the CGI in The Magnificent Kotobuki isn’t that great but I still enjoyed the action in this show. The renders for the planes fare a little bit better than the characters’ and I really like the use of close-ups and wide shots to keep the fighting intense and allow you to feel like you’re in the plane with the pilot. If anything, my concern is more with the fact that this premiere is pretty much just action. You barely get to know any of the main characters. I suppose this episode is simply meant to set up the world and tone it aims to present but I sure hope the next episode will offer some actual characterization. 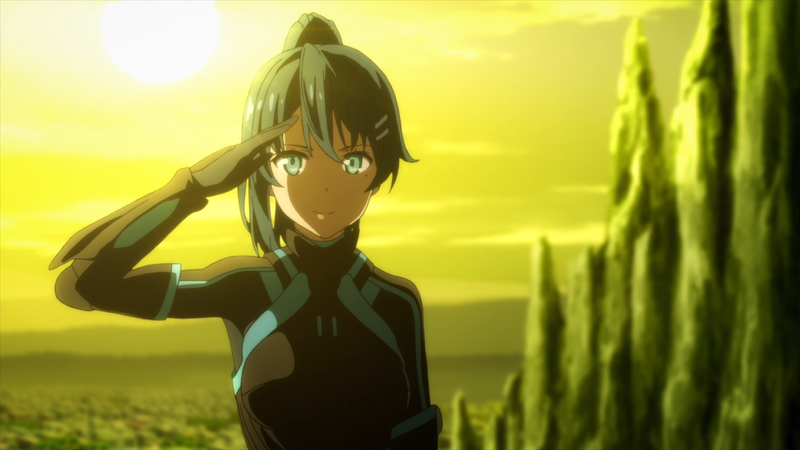 This entry was posted in Anime, Episode Reviews, First Impressions, Lightning Rounds and tagged Action, Adventure, Anime, Brain's Base, Dimension High School, Egao no Daika, Episode Reviews, Fantasy, First Impressions, GEMBA, Girly Air Force, Grimms Notes the Animation, Kouya no Kotobuki Hikoutai, Lightning Round, Magic, Mecha, Military, Quiz, Satelight, School, Sci-Fi, Tatsunoko, The Magnificent Kotobuki, The Price of Smiles, WAO World. Bookmark the permalink.